At The Mission Hospital, Durgapur we believe in the immortal saying of Swami Vivekananda- Service to man is service to God. We believe that each patient has the right to get best treatment and best attention from each member of The Mission Hospital family each time, every time. Our passion for perfection has inspired us to document the usual hospital routine services and standard procedures for understanding of all patients, their family members, casual visitors and even each hospital staff for seamless functioning of each department, leading to world-class service to each patient as end product. · Based on advice from Consultant, if you require admission, then you need to complete required formalities at “Admission Counter” at ground floor. · Reception is open round the clock but still in case of exigency admission is done through Emergency Department also. The Medical Officer in the Emergency may recommend and advise admission accordingly. · During admission, you are usually asked a few questions and your cooperation is solicited only to help you better. · The treating consultant shall specify the tentative duration of your stay in the hospital and based on that an advance payment has to be made in the Admission Desk. · The admission procedure covers some formalities to avoid future complications and should usually take 30 minutes. If your account is to be settled by any empanelled companies / organizations / Third Party Administrator (TPA), you must bring with you an authorization letter from the company clearly indicating that they have taken the financial responsibility for all medical treatment. Your treatment will be in the category specified by your organization. Separate direct bill will be made for any deviations from whatsoever has been allowed by your company. Such an order can also be faxed to the CEO of The Mission Hospital directly. The hospital will invite you for detailed discussion in case any ‘Package’ has to be finalized. Further, you should feel free to enquire about approximate cost of treatment, hospital charges, cost of investigations etc., either during admission or earlier from our Reception for efficient time management and decision taking. (Private/Deluxe/Deluxe Suites are provided with TV, Refrigerator, Telephone, and Internet & Personal Attendant Services)The Hospital is having centralized air-condition. However, all beds and rooms / suites are given on first come first served basis subject to availability. Request for room change, if any, has to be made at the Admission Desk /Floor co-coordinator, who will try to accommodate your request as soon as possible, subject to availability. · After the advance payment, as treatment progresses, it is better to go on making interim payment in consultation with the concerned people in the billing section. This updating of payments, periodically, helps smooth progress of entire procedure. · Final payment has to be made at the time of discharge of patient for which the bill section will consolidate all charges for medicines/ consumables / services availed during hospitalization. The Billing department should be allowed some reasonable time as soon as the doctor signs the order for discharge. · Bills for Insured / Corporate Clients are handled separately, but the “No Due”/ “Gate Pass” has to be collected from Billing Department before discharge. · Check Out Time 12:00 Clock (Noon) applicable. · Cheque: Received Only for Corporates having MOU with us. (Not by personal cheque). · For Availing “Online Service” please contact billing personnel at the billing department. · After admission all the financial transaction for indoor patient will be made from “Billing Department” at 6th floor. · Please check the entire document properly before leaving the counter. · Minimum discharge process time: 3 / 4 hours after the advise for discharge by the consultant (except corporate & TPA or insurance patient as it subjected to receiving the authorization from the TPA). · Please donate/replace the blood/blood product before the settlement of final bill which is used for your patient (if any) during the hospitalization period..
· The ‘Visiting Card” has to be submitted to billing department at the time of final payment which was issued at the time of admission. The Mission Hospital offers very reasonable and competitive packages for different surgeries like Cardiac surgery, Uro-surgery, Orthopedics, Spine, ENT as well as Angioplasty, etc. Full advance payment is must for such planned surgeries as per mutual agreement. The unique aspect of the packages of The Mission Hospital is that once the deal is done no escalation is there, even if actual cost goes up considerably. In emergency cases, the payment has to be made within 24 hours of admission or earlier. In general, outstanding amount beyond Rs. 5,000/- is not permissible. Smooth payment of bills in time optimizes every body’s interest. As Inpatient - “You are Our Guest”. Your quick discharge after a sound recovery being the objective, highly skilled and dedicated team of personnel is at work round the clock to ensure your stay as Inpatient pleasantly comfortable. But your spontaneous cooperation makes their task easier. Your treatment as Inpatient is the responsibility of your admitting Consultant. He will arrange for your laboratory/radiological tests, medications, diet and all special treatment, deemed necessary. But if you are already on any kind of medications, before admission never forget to inform your Nurse or Resident Doctor for guidance. During the period of your hospitalization, your Consultant has to approve the use of those medicines. In addition to your treating Consultant, you will be looked after by a team comprising In-house RMO’s to ensure your proper treatment round the clock. They are the most important link in between the service providers on one hand and the Consultant on the other. RMO’s execute the instructions given by the Consultant. We are proud of our team of highly skilled and competent Nursing Staff who will ensure professional care with smile and enthusiasm. They work in tandem with all for your quick recovery. She will ensure administration of medicine and execution of treatment. In case of any emergency, she will take required action. Push the CALL BUTTON to draw Nurse’s attention, if required. Ward personnel are responsible for cleanliness, your movement by stretchers/wheel chair, if required. Kitchen staff caters you the prescribed diets. They serve better with mutual co-operation and understanding. In addition to the consent taken from you at the time of admission, you need to give further consents for Special Procedures to be undertaken during treatment as advised by your Consultant. Nursing staff will bring the form to you for the same. Clothing and linen for daily change will be provided. Using them is compulsory and a part of Inpatient protocol. In case of any problem please contact sister-in-charge or co-coordinator of the respective floor who will take care of your need regarding linen. Hospital does not take any responsibility for your money or any other valuables. The less is better and welcome. Use of mobile phone by the patient is strictly prohibited. Visitors should also restrict use of mobile phones near patients. Medicines, Surgical and other consumables prescribed by your Consultants for your treatment shall be supplied from in-house pharmacy for which you need to sign a memo for inclusion in the bill. For your maintenance/service requirements for TV, AC, Power Points, Push Button for calling Nurse, plumbing’s in toilets, telephone and the like, our maintenance staff are available on call. Preventive maintenance is done every day as a part of standard procedure. Please inform the nurse about your specific requirement with a lead-time of, say, 45 minutes. Keeping the hospital neat and clean and highly disinfected is a part of our organizational culture. The waste is segregated into biodegradable and non-biodegradable categories and disposed to its right destination. Let us all help to keep the quantum of waste as less as possible. Management has kept enough space in parking lot at the backside of the hospital by paying the requisite parking fees. Keep cars in orderly manner. To facilitate movement of ambulances, parking of Cars / Vehicles in front of the hospital is prohibited. For any help contact the security personnel posted outside. As you feel fit and fine and your doctor also feels the same way, your time to leave hospital comes and the same is indicated in your medical record in writing. As soon as the attending nurse is informed by the doctor, the Billing Department starts the billing process. More or less around two hours have to be given to the hospital to complete all formalities. On the other hand, you or your relatives are to be available to pay the bills, collect receipt, to adhere to guidance given on discharge medications by doctors, nurses or other concerned technicians as well as for collection of concerned files and papers. 1. For Medico Legal Cases (MLC), Govt. of India rules are to be followed including FIR, diaries and post mortem etc. In case of Birth / Expiry - an interim birth/death certificate is issued by The Mission Hospital, but the official certificate in this regard has to be collected from DMC in due course of time. 3. 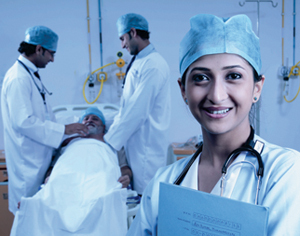 Medical Certificates are issued to patients as per requirement based on the facts available. This certificate is available on request from the treating consultants in between 9:00 A.M. to 5:00 P.M. on all working days. 4. Chairs/Trolleys are available on request in OPD. 5. Feedback: The Mission Hospital welcomes your valued feedback about your experience on over all service quality & we highly expect you to fill up the Feed Back Form presented to you by our Floor Coordinators. We want to learn from your opinion and bring required changes for still better patient care. When your patient is a child or an elderly person, kindly convey their feedback to us as their custodian. Located at ground floor, the 24- hour Pharmacy is capable of supplying all life saving medications to the patients as well as the neighboring population round the clock. Blood is both important and critical for life saving and healthcare. The Blood Bank of the hospital is not only the best in this region but most advanced too. All components, including FFP, Single Donor Platelets, and Cryoprecipitate are available. Facilities for leucocyte depleted blood are also available for our patient. Not entertained, as hospital provides clothing to each patient. Hospital Laundry service takes care of all washing requirements. Special needs for clothing’s/beds/wheel chairs are taken care of as per requirement on no profit basis for the benefit of patients needing prolonged stay. Always in full supply through water purifier facilities in entire hospital. The cafeteria at The Mission Hospital is open from 7.30 A.M. to 10.00 P.M. After 10.00 p.m. supply is absolutely limited based on the discretion of the Night Manager. ENTIRE HOSPITAL IS A NO-SMOKING ZONE. HELP US TO MAINTAIN IT. WE ARE GRATEFUL FOR YOUR TRUST. WE CARE FOR YOUR GOOD HEALTH AND LONG LIFE. 1. Smoking is completely prohibited within the hospital premises. 2. Please do not operate the oxygen/vacuum units yourself. 3. Please do not wash personal clothes in the hospital premises. 4. Please do not give any tips to any hospital staff. 5. All payments and bill settlements must strictly be made at the cash counter only against a proper receipt. 6. All payments should be made in cash/bank draft/valid credit cards (except Diners Club & Amex Cards). WE DO NOT ACCEPT PERSONAL CHEQUE PAYMENTS. 7. Please maintain silence in the hospital premises. that the care of patients is not disrupted. Visitors must abide by the rules. 9. Visitors must park their vehicles in visitors parking areas only, behind the hospital building. 10. Visitors should refrain from sitting or lying on patient bed, floors of patient rooms. 11. Visitors are not permitted in non-patient areas such as utility rooms, nurses’ stations and kitchens. Visitors may use the cafeteria and waiting area and reserved lounges. 12. No food or beverage may be brought into patient rooms. 13. To protect patients from infections and allergies, visitors are not permitted to bring flowers. 14. Visitors are not permitted to administer any medical treatment(s) to the patient. 15. Visitors are not to consume alcoholic beverages or illegal drugs, litter or loiter in the hallways while within hospital. 16. Children below the age of 13 are not allowed as visitor. 17. For reasons of infection control, we can accommodate only one attendant with the patient at a time, except during the visiting hours. 18. Please switch off your phones, pagers, beepers and other wireless equipment in patient areas and the Intensive Care zones in the hospital, such as the CCU / ICCU / NICU / CTVs ITU as these interfere with the sophisticated patient monitoring systems. 19. Please avoid bringing costly items like cell phones, jewellery or valuable items to the hospital. There might be a chance of losing / misplacing them. The hospital authority will not be responsible for any such loss / misplacements. 20. Please do not make use of candles, dhoop, agarbattis, lighters, matchboxes etc. as they are a potential hazard in a hospital and can also trigger our sensitive smoke detecting system. 21. Visitors to patients in an isolation area are subject to isolation guidelines. Visitors should check with the patient’s nurse for specifics. 22. 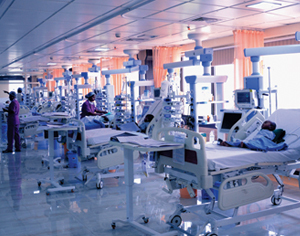 Nursing staff may restrict the number of visitors, if the condition of the patient in the room requires it. 23. Please co-operate with Security Staff and the liftmen. 24. Please use staircase while coming down.